Last major update issued on December 8, 2005 at 05:25 UTC. The geomagnetic field was inactive on December 7. Solar wind speed ranged between 299 and 371 (all day average 325) km/sec. Three hour interval K indices: 00000000 (planetary), 00101000 (Boulder). Region 10830 was mostly unchanged and quiet. 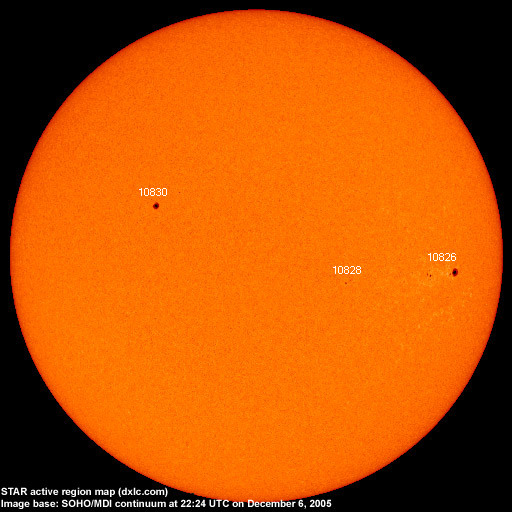 December 5-7: No obvious partly or fully Earth directed CMEs were observed. 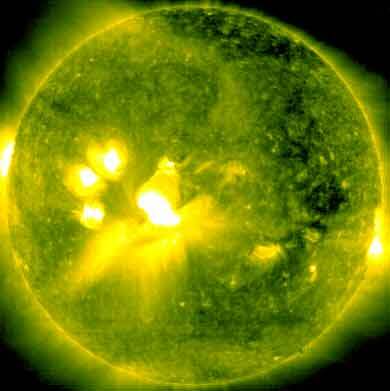 The geomagnetic field is expected to be mostly quiet on December 8-10. Long distance low and medium frequency (below 2 MHz) propagation along east-west paths over high and upper middle latitudes is fair. Propagation on long distance northeast-southwest paths is poor. Trans Atlantic propagation conditions are normally monitored every night on 1470 kHz. Dominant stations tonight: WLAM Lewiston ME and WWNN Pompano Beach FL. Propagation was poorer than expected considering the inactive geomagnetic field. 1700 kHz had both KVNS Brownsville TX and WJCC Miami Springs at 05 UTC.